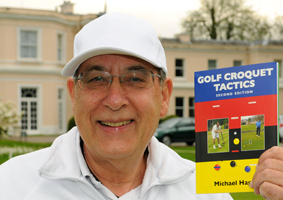 Roger Goldring won our Winter Competition by a clear margin and with it the prize of Michael Haigue's 'Golf Croquet Tactics' book. Chris Roberts asked Ann Norman to make the presentation to Roger so that he (Chris) didn't have to kiss him! Today saw the completion of our scheduled beginners training programme of four sessions. Additionally, new member Christine Brazier (who has played before with the Roehampton Club) will also be a new face at 'all comers'. There was a last minute rush and some 'arm-twisting' before entries close for our season-long competitions today. The playing schedules will be published on this website and in the pavilion shortly. Ah! The Summer season is here and we are all in white - it's croquet - hurrah! Sign-up in the pavilion NOW! The knock-out playing grids for all competitons have now been finalised. The six level play competitions have been subject to seeding (by players' handicap rank and index points) and the handicap singles was randomly drawn this morning, in the members bar by our non-playing secretary Derek Whittingham. Click on these buttons to see who you have got in your first game! 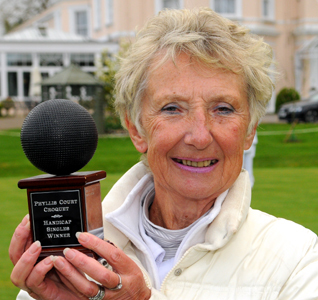 It was a family affair at the end of a long first tournament of the season when Delia Norris added her name to the Black Ball trophy winners list today. It was a long and taxing day of mostly tight games, as one might have hoped for with handicap evening out the entire field. cool (and lead) to thwart Chris Roberts. Her block was decided on point difference following a three way tie and two of the other blocks were similarly tight. Dianne Brown won Block A, Roger Goldring took Block C and Hugh Crook topped Block D.
Only in Block B was there an undefeated winner in the shape of Colin Morgan. The four runners up also progressed to the main knock-out and here Delia Norris and Richard Peperell won a great games to both sneak past Goldring and Morgan respectively 7-6. 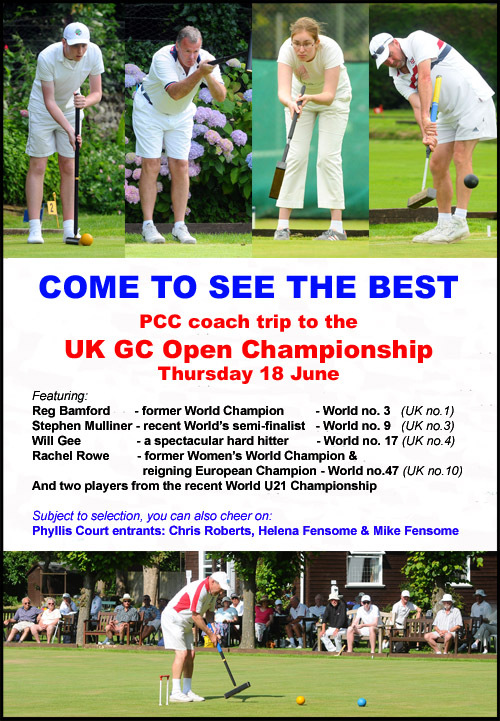 Ian Norris and Dianne Brown won through o the semis as well, and all four still in the competition duly qualified for the Southern Area Final of the All England Handicap (national competition) for which this PCC tournament was acting as a qualifier. The knock-out format happened to keep Mr & Mrs Norris apart in the semis and both duly prevailed to set up an intriguing final with Ian defending 10 extra turns. In the event its was all too much for him as Delia played faultlessly and won at a canter 7-0 with two extra turns standing. Well done Delia indeed! Special thanks go Philip Allison for standing in for a late withdrawal and to Jim Walter for 'having the balls' to enter his first singles tournament and seeing his play improve throughout the day. Phyllis Court got their Inter-Club Murphy Shield (National knock-out) campaign off to a great start with victory over visitors Hurlingham today. It is always nice to welcome clubs from further afield to the banks of the River Thames at Henley in Oxfordshire, and all the more so when visitors are linked to us as a reciprocal Club. The Murphy Shield is a restricted competition in which teams can field one player who is a 2 handicap, and the sum of all four team players' handicaps must be 12 or more. Mike Fensome (2) and Frances Colman (3) teamed up as our numbers 1 & 2 and won a good first doubles match in three games against Hurlingham's Tony Bingham (2) and John Malvern (3). All four players' good clearance percentages were the feature of the encounter. Meanwhile Don Rutherford (3) lost in three games to John Culhane (5) but Mary Gaynor (4) earned Phyllis Court a lunch-time lead with a straight two-game win over Veronica Carlisle (4). The second half of the fixture was quite tight with three of the four matches going to a deciding game. Fensome saw off Bingham in two games and Colman's victory over Malvern settled the fixture for the home side, before the visitors' Carlisle and Culhane rallied to bring the end result to 4-3. Phyllis Court go on to play Leighton-Linslade, who got a bye into the next round, on a date and at a venue to be decided. Chris Roberts won 11 games on the trot to win the Sidmouth GC Open for the first time this weekend. Just as satisfying, was that he laid to rest a couple of 'bogie' players, against whom, he had experienced difficulty with in the past. This win, and victories over four 'top 20' players in the last fortnight has seen his UK ranking climb to 24th, which is his higest rank yet. Helena Fensome also felw the flag for PCC at the same two events where she got some good 'scalps' at Surbiton two weeks ago but was less sucessful on the Devon coast. Raghu Iyer won four out of four to emerge as a clear winner of our Annual Charity One Ball Handicap event today. He played a cagey style of game and did it very well, accounting for Philip Allison, Dianne Brown, Harry Midgley and Robin Morrell. Dianne finished second having recorded just that one loss and Harry came in third. More importantly,our 13 players raised £130 for Bowel Cancer UK and this will hopefully be added on Thursday when an election day side sweep stake will be offered for a bit of fun. As the top two finishers, Raghu and Dianne had first refusal on the two places that Phyllis Court have earned at the National Charity One Ball Final at Surbiton on 10 May. Dianne has decided not to take up her place and so Chairman Harry will accompany Raghu as our representatives. Footnote - Richard Peperell was sartorial elegance personified today with purple bandanna and matching underpants worn outside his white trousers! Results (min 4 games to be classified): Raghu Iyer 4/4 (100%), Dianne Browne 3/4 (75%), Harry Midgley 3/5 (60%), Robin Morrell 2/4 (50%), Deon Melck 2/4 (50%), Di Pascoe 2/5 (40%), Richard Peperell 1/4 (25%), Philip Allison 1/4 (25%), Joanna Iyer 1/4 (25%). Others: Frances Colman 2/3, Chris Roberts 2/3, Mike Seagrief 1/3, Pauline Wood 1/3.